Adams Heating and Cooling provides water heater installation, water heater repair, and water heater maintenance in the Kalamazoo, MI area. Adams service is second to none, and they have been a trusted source for heating and cooling needs for over 25 years. Water heaters heat the domestic water for your home using a thermodynamic process for the purposes of cooking, cleaning, bathing, and space heating. 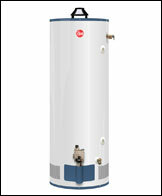 There are two (2) types of water heaters: tank-type water heaters and tankless water heater. Tank water heaters have a specified amount of water sitting in them, usually between 30 and 75 gallons at a time, that stays hot constantly. These are good for anyone who wants to take hot showers. Tankless or “On Demand” only heat when water is turned on, and this type is more energy efficient. How often is water heater maintenance needed? Tank products should be flushed on a yearly basis. Tankless products need to be de-limed or de-scaled on a yearly basis. Adams can complete this for you with an Annual Tune Up. What brands are sold by Adams? Adams uses Rheem tank products, and Bosch tankless or On Demand products. What else should people know about Water Heaters? When you purchase a water heater, you will also need whole house water filters and a water softener. Also, before purchasing an On Demand or tankless water heater you should have a water quality test performed. Call Adams Heating and Cooling for water heater installation.